When Johann Gutenberg invented the printing press with loose type in the 15th century, he cleared the way for the gradual proliferation of the printed word. It would seem an obvious second step to use the printing technology to create a machine that could take over the cumbersome task of hand writing. The engineers and inventors of the day were clever enough. A clock, after all, has a mechanism that would seem far more complex than that of a typewriter. So why didn't they build one until 400 years later? The answer is simple enough. There was no need for typewriters in a world where cheap labor was abundant and where machines were expensive. It was not until the 19th Century, when industrial production was automated and boomed, that the time was ripe for the typewriter. Soon the typewriter took its rightful place as one of the great inventions of 19th Century communications technology, alongside the telegraph, the telephone, photograpy and the gramophone. And, it gained a respected place in wealthier homes, as can be seen in Pic 2, a family portrait from around 1890 where the three men play the violin (left), read a book (right) and write on a typewriter (center). 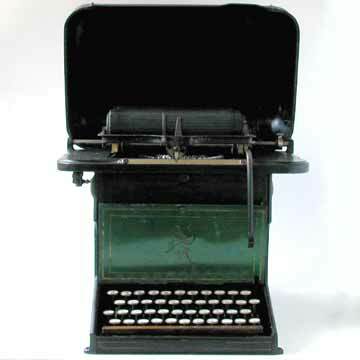 Development did not end with the first Sholes & Glidden, despite the fact that this machine set a series of standards that are still in use today, including the Qwerty keyboard. The strangest contraptions were designed (pic 3) and built in the first half century of the Typewriter (see collection). And of course, the machine played its role in social history, by forcing the way for women into the office (pic 3 - also see 'social relevance'). Picture 5, finally, gives us a glimpse at one of the many odd ways the typewriter played a role in history, here in de form of a colonial advertisement.